Here’s another report that crushes the myth that entrepreneurship is only for the young: The Coming Entrepreneurship Boom by Dane Stanler and published by the Kauffman Foundation. 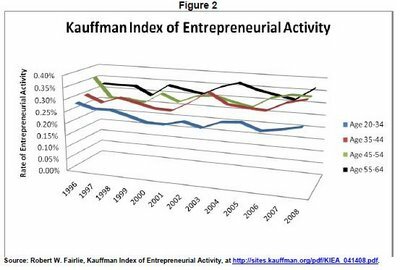 Contrary to popularly held assumptions, it turns out that over the past decade or so, the highest rate of entrepreneurial activity belongs to the 55-64 age group. The 20-34 age bracket, meanwhile, which is usually identified with swashbuckling and risk-taking youth (think Facebook and Google), has the lowest. Perhaps most surprising, this disparity occurred in the 11 years around the dot-com boom—when the young entrepreneurial upstart became a cultural icon.